Hooray for my first birthday as a new mom. I must have called for a big celebration but because my hubby always reminded me to save up, I turned to my ever creative and resourceful self and looked for other means to make myself happy. I love celebrating special occasions especially if it's my birthday. I always aimed to have a memorable birthday by expecting a customized cake, gifts, dining out, birthday greetings from friends and family and lots of surprises. I admit I still act childish in so many ways but that's how I am. Let me share with you how I spent my birthday this year. I was excited for my lined up activities for that day. As I was about to brush my teeth, I saw no water coming out of the faucet. The whole building was temporarily out of water due to some problems. Wow what a nice surprise to start my day. We decided to transfer to my mom's house for the mean time until the water would be back. Mom & Baby just-woke-up look. a Hot Chocolate drink meal. Yummy! 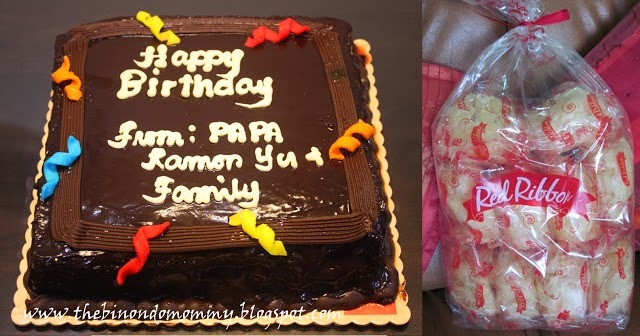 Thanks to mother-in-law for these goodies from Red Ribbon. Yey cake! I just remembered that I have a St. Nails Gift Certificate won from The Soshal Network blog giveaway expiring on my birthday so I decided to commute to Makati for a nail pamper treat. Besides, my last manicure/pedicure was more than a year ago, during my wedding. Haha! 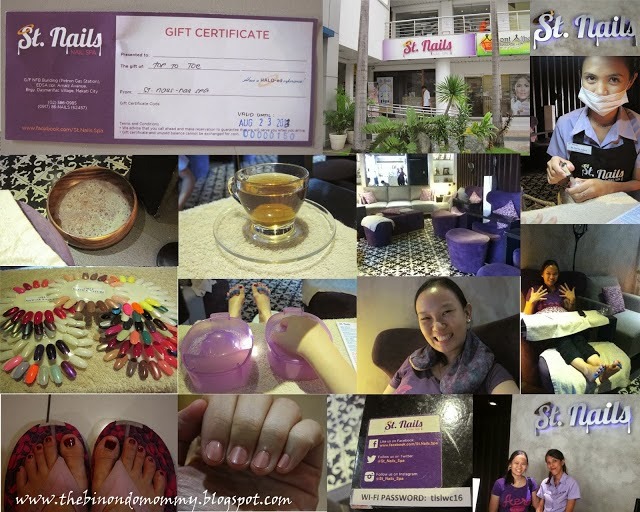 I enjoyed my free Top to Toe manicure pedicure service at St. Nails Nail Spa. A coupon that I won from TSN blog 2 months ago. As you can see, I'm not used to pampering myself so I don't have any idea how other nail spas perform. With my experience at St. Nails, it was nice of them to serve hot cup of tea, to put hot aroma heat pack to my shoulders, bubble water to soak my feet and hands and free wifi! I was actually amazed by the purple plastic basin to soak my hands on as it was my first time to see that kind of thing. The ambiance and their stylish purple seat were also commendable. The name of the nail technician who did my mani/pedi was Ms. Sahira. Later did I know that the owner is an alumni of DLSU and his name is Saint. I didn't know him personally but his name rings a bell because he's famous in school. 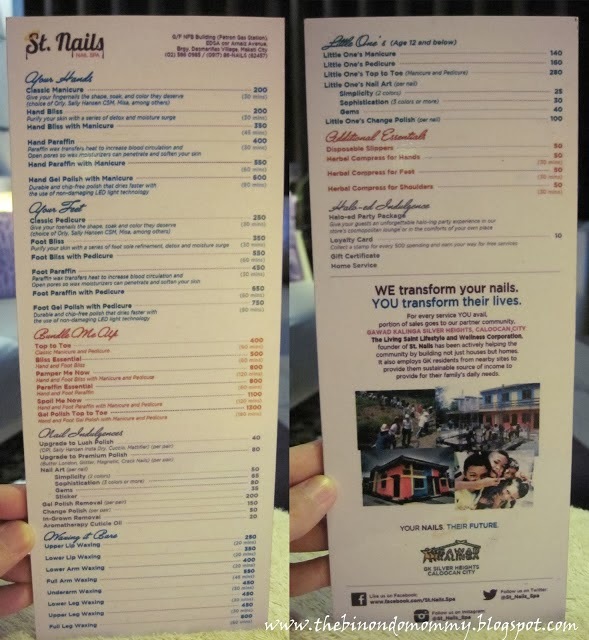 St. Nails list of services. Like their FB Page at St. Nails and follow their Twitter @St_Nails_Spa and Instagram @St_Nails_Spa to get to know them better. Watch out for their first anniversary this coming Sept. 16, 2013 as they might be having promos. 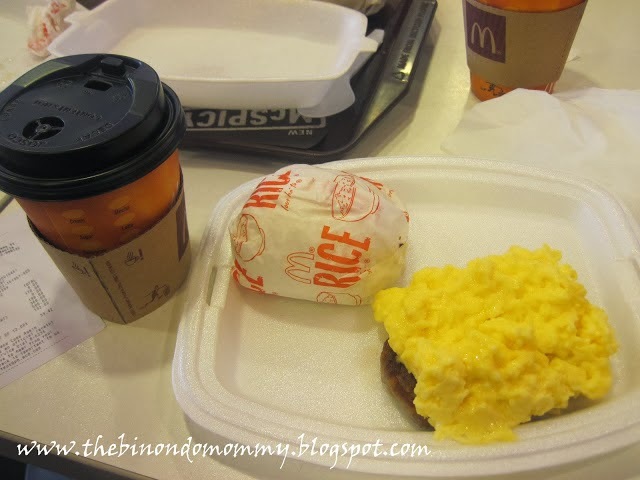 They currently only have one branch for now and it's located at Petron Gas Station, EDSA corner Arnaiz Ave. (Pasay Road), Dasmarinas Village, Makati. 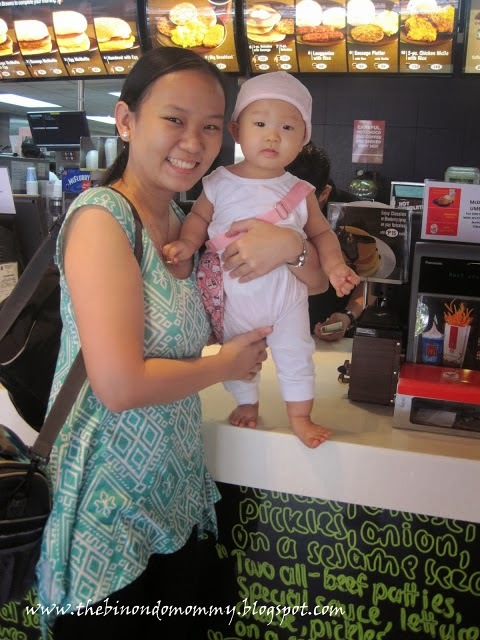 For our dinner, we availed of our free Pizza Hut treat, a BPI credit card promo, using my hubby's receipts. 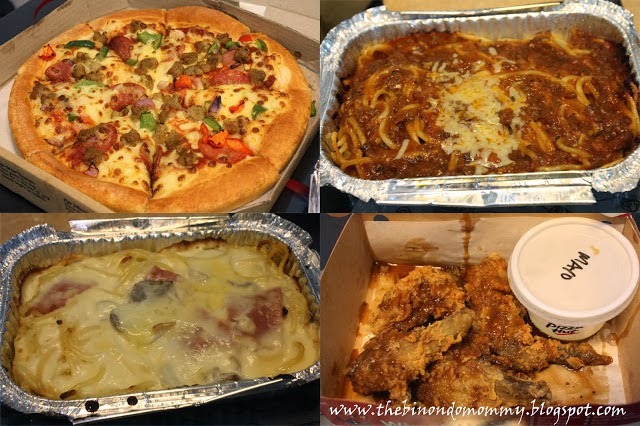 We got one Family Size Supreme Line Pan Pizza (for at least P12k receipt) and one Single Spaghetti Bolognese w/o Meatballs (for at least P2k receipt). We just added the Carbonara and 4pc Chicken Wings Honey BBQ flavor to make our dinner full. Btw, the next promo for BPI credit card is Chowking treat just in case you want to know. We had Pizza Hut for dinner. 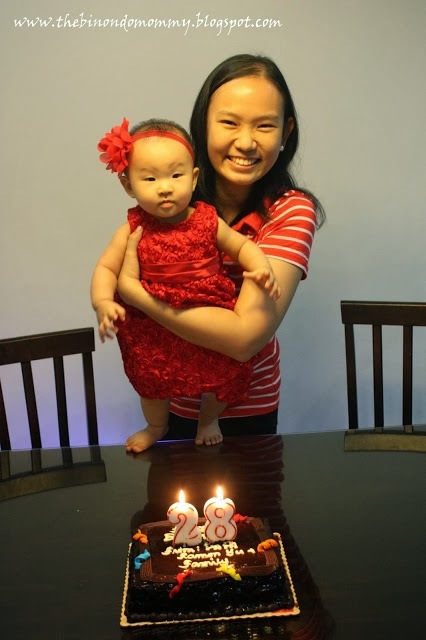 My first birthday as a mom, a certified mommy on my 28th! Surprisingly, my birthday celebration didn't end here. There's still a Day 2, on my next post. 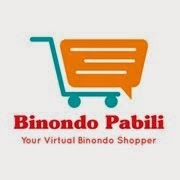 Happy Birthday Binondo Mommy! Share to me too how you spent your birthday or how you have fun without spending. I would like to hear from you. Or you may just greet me your birthday wishes thru the comments below. Happy birthday, Sally!!! Thank you for sharing :-) And yes, famous si Saint hahaha!